By Laura J. Praglin, Ph.D., L.M.S.W. Jessie Donaldson Hodder (1867-1931) was a pioneering reformer in the areas of child welfare, medical social service, and criminal justice. She is best known for her innovative contributions to the welfare of incarcerated girls and women as superintendent of the Massachusetts Reformatory for Women (1911-1931). Jessie Donaldson was born in Cincinnati, Ohio, to William and Mary (Hall) Donaldson. Her mother died when Jessie was two years old, and she was raised by a grandmother. Few details of her life are known until she moved to New York City at age 23. She soon met Alfred LeRoy Hodder, a lawyer and graduate student of philosopher William James at Harvard. The couple entered into a common-law marriage and moved to Europe, where Alfred continued his graduate work in philosophy and Jessie studied music; she was known as an excellent pianist. Their daughter, Olive, was born in Zurich in 1893. They returned to the United States after Alfred secured a position teaching English at Bryn Mawr College (1895-98). Their second child, J. Alan, was born in 1897. In 1898, after leaving Bryn Mawr, Alfred sent Jessie and children to Switzerland, promising to join them. He never did, for he had fallen in love with a Bryn Mawr English professor, Mary “Mamie” Gwinn (1861-1940). He married Gwinn in 1904, denying any common-law marriage to Jessie, who was left isolated and penniless in Europe. She became even more bereft after her daughter Olive died shortly thereafter. Alice Gibbens James, William James’s wife, intervened and urged Hodder to return to the United States, writing a letter of introduction to Elizabeth (Bessie) Glendower Evans, a philanthropist and a trustee of the Massachusetts reformatory system. 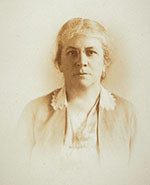 Hodder arrived in Boston in 1906, and with Evans’s help, secured a position as matron (house mother) at the Industrial School for Girls in Lancaster, MA. Evans also assisted her in obtaining legal counsel and filing suit against Hodder for bigamy. However, shortly before the trial in 1907, Alfred Hodder died. Jessie Hodder soon proved herself a highly competent and compassionate worker at the Lancaster Industrial School, itself a model of progressive reform in housing girls and women charged with delinquency or vagrancy. Hodder defied prevailing social customs that urged institutionalization of illegitimate children. Hodder instead developed guidelines and services to assist mothers in keeping their out-of-wedlock children. Fathers, she believed, should be sued for child support, but not be forced into marriage. Upon the recommendation of Bessie Evans, who praised her progressive spirit and pioneering efforts at the Lancaster School, Dr. Richard Clarke Cabot offered Hodder an apprenticeship at his new social service clinic at Massachusetts General Hospital. From 1907-11, Hodder ably served as an outpatient counselor to the “sexually deviate” (Cabot, 1906) at MGH, including unmarried mothers and those with venereal diseases. In 1911, Hodder was appointed Superintendent of the Massachusetts Prison and Reformatory for Women at Sherborn (1911-31). Established in 1877, the Reformatory was the second correctional institution for women in the United States, and remains the oldest in existence, now operating as MCI-Framingham. Annexed by the town of Framingham in 1924, the reformatory contained a 400-acre farm, as well as buildings dedicated to the domestic arts, trades and light manufacturing. Hodder’s institution served as a model for women’s correctional facilities in the U.S. and abroad, embracing significant reforms in education, social service delivery, scientific management, and legislative advocacy. Hodder and her staff, who included female physicians and guards, welcomed a host of visitors who subsequently implemented many of her innovative practices in their own facilities. Hodder humanized the prison environment, encouraging women and girls to undertake productive work alongside education and recreation. She renovated the disciplinary quarters into a gymnasium, unblocked the windows to let in a view of the grounds, and opened a school staffed by trained teachers. Those with the aptitude were encouraged to enroll in university extension courses in domestic science, business, and other fields. The full workday was replaced by an intensive half-day, to allow time for therapeutic activities such as sports, art, drama, and music. Both morale and productivity increased so significantly as a result that Hodder convinced the Massachusetts legislature to endorse her reforms. Certain inmates were also permitted to work off the grounds and save their earnings in their own bank accounts. Hodder highly valued the contributions of sociology and psychology to understanding delinquency and to formulating effective and humane policies within the reformatory. Hodder employed a resident social worker, established a research department, and required the best medical and psychiatric care for inmates. She also insisted upon detailed case records, a practice she adopted from the social service department at Massachusetts General Hospital. These records were necessary for parole considerations, but more importantly helped to individualize the inmate’s treatment within the facility. Hodder welcomed testing new theories and instituting experimental programs to further improve the welfare of girls and women under her charge. She invited renowned criminologists Sheldon and Eleanor Glueck to study five hundred women at the reformatory in the early 1930’s (Glueck & Glueck, 1934). The Gluecks praised Hodder’s “combination of a sophisticated scientific approach with an intense maternal commitment” (“Hodder,” 1971), and cited the institution as an effective model for the country at large. As an esteemed prison reformer nationally and internationally, Hodder helped to further women’s correctional reform through presentations, research and writing. She frequently delivered papers at the conferences of the National Council of Social Work and the National Prison Association. In 1921, she visited and recorded her impressions of many European women’s prisons and reformatories (Hodder Papers, Schlesinger Library), and served as a delegate to the International Prison Congress in London in 1925. Hodder’s impressive contributions also resulted in U.S. Presidential appointments to the National Crime Commission in 1927 (under Calvin Coolidge) and to the Wickersham Commission on Law Observance and Enforcement in 1929 (under Herbert Hoover). Bakeman, P. (1935). Treatment at the Massachusetts Reformatory for Women under Jessie D. Hodder: 1911-1931. Thesis (M.A. ), University of Chicago, School of Social Service Administration. Cabot, R.C. (1907, September 18). Letter to Ida M. Cannon. Massachusetts General Hospital, Archives and Special Collections, Social Service Department Records, 1899-1990, AC2, c. 4, folder: Cabot, Richard-Correspondence, n.d.; 1907-1932. Glueck, S., & Glueck, E. T. (1934). Five Hundred Delinquent Women. Oxford, U.K: Knopf. Gunter, S.E. (2009). Alice in Jamesland: The Story of Alice Howe Gibbens James. Lincoln: University of Nebraska Press, 2009. Hodder, Alfred and Mary Gwinn Hodder Papers; 1875-1941. Manuscripts Division, Department of Rare Books and Special Collections, Princeton University Library. Hodder, Jessie Donaldson, 1867-1931. Papers, 1873-1931: A Finding Aid. Arthur and Elizabeth Schlesinger Library on the History of Women in America, Radcliffe College. “Hodder, Jessie Donaldson” (1971). Notable American Women, 1607-1950: A Biographical Dictionary. Ed. E.T. James, J.W. James; & P.S. Boyer (vol. 2, pp.197-99). Cambridge, Mass: Belknap Press of Harvard University Press. Parr, J. L., & Swope, K. A. (2008). Framingham Legends & Lore. Charleston, SC: The History Press.